Successfully Added Mind Blowing Cell Phone Watch in Stainless Steel to your Shopping Cart. 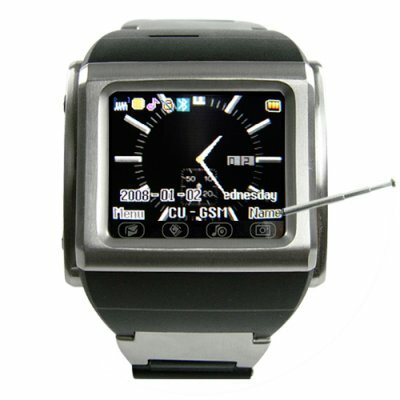 Tri-Band (900, 1800, 1900) stainless steel cellphone watch with 1 GB of memory and easy to use touch screen display. Adding to our blooming mobile phone product range is this new simple but elegant cell phone watch finished in stainless steel. A brilliant timepiece complete with all the convenience of a cell phone, perfect for light travelers. Fill the micro SD card (1GB included) with movies and music to take with you on the go, and listen with crystal clear sound over an excellent Bluetooth connection. Features like the organizer, and sneaky side mounted camera add to this very attractive package. This is a watch that will impress the guys with it's great features and the girls with its masculine looks, be the center of attention today, get one now and have it delivered to your door in just a few days. NOTE 1: This product is compatible with GSM at 900MHz, 1800MHz, 1900MHz. Please check with your network provider if you are unsure of your band requirement. NOTE 2: The SIM card slot is in the back of the item, you can only put SIM card in after you remove the battery. I just got mine and its out of control. by the way chinavasion is amazing the product was always being tracked and got to me in three days simply brilliant. Oh wow! Maxwell Smart to Ninety-nine: I am just blown away - this is a fine product in every way. The screen is even in brightest sun light good to see. One or two wider plastic links for the wrist band would be advisable to pack with it, but it also came with an international power adapter, not shown with the accessories on site! I believe that worths the money for the all that has to offer....it might be a little large because its a mobile phone, but is very light..